What does a leaking cylinder head gasket look like ? In my machine shop business, we get both professional mechanics and "do it yourself" customers who bring us cylinder heads to check but are not sure if they had a leaking head gasket or not. We see so many of them that it is usually obvious to us where a gasket was leaking. Sometimes the gasket is just completely blown, other times it is simply leaking and allowing combustion gasses to get from the cylinder into the water cooling passages. Most of the time a completely blown head gasket will be the older style composition material gasket. The newer all metal gaskets rarely will completely fail, they usually just start to leak. In any case I am going to add pictures to this page as I get them to help you identify a leaking or blown head gasket. Take a good look at the following picture of a multi layer steel gasket on a Honda cylinder head that is leaking combustion gas to the cooling system. This failure was pretty obvious. Some are not this pronounced and you really need to look close to see the failure area. First take a look at the green arrows. 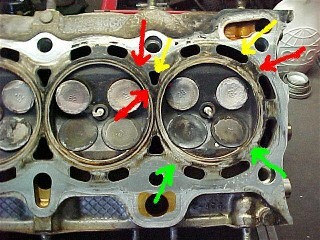 They show what the cylinder head should look like if the gasket is sealing properly. Note that the surface is still clean shiny aluminum. Now look at the areas that the red arrows are pointing to. Those are the areas where the gasket was not sealing and was allowing the hot gases from the cylinder to pass through to the cooling passages which are pointed out by the yellow arrows. I hope these pictures will help you in your troubleshooting. As I get new ones of different types of failures, I will add them. As always, if you have any type of questions, please use my contact form to ask them. I will try to answer as soon as I can. I really enjoy helping people repair thier engines and want you do have a good experience with the procedure.